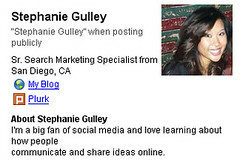 Hey Steph, you always have the best news and features about web 2.0 gadgets that can make our lives more productive and fun. I check out your site as much as I look at techcrunch and mashable. Keep up the great content and I’ll make sure to send more people your way! Thanks you guys! It’s always fun to find new tools that make our lives easier. I’m glad you enjoy it. Don’t forget that you guys are most likely online as much as I am so please, feel free to ping me and lmk what new site you’re hanging out at or using.